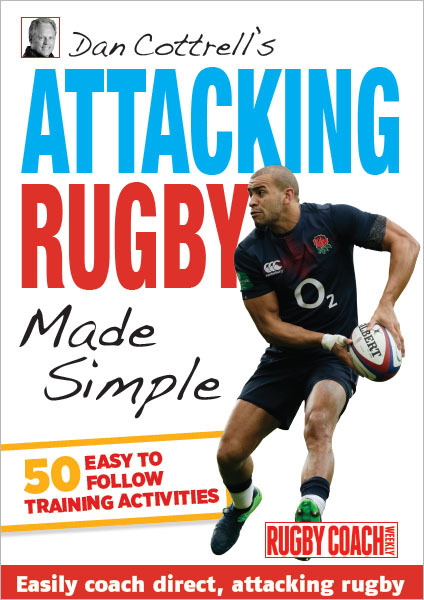 Attacking Rugby Made Simple is a clear, direct, guide to coaching attacking rugby. I break down the skills and principles you need to coach and then provide sessions to work on each area. Unless you’re just playing full-on matches, we have to coach attacking rugby by breaking it down into its component parts. Use my manual Attacking Rugby Made Simple, which has 50 different activities and games, to cover decision making, handling, contact, evasion and kicking. Put attack skills into game-realistic scenarios. This manual contains 50 sessions that are designed so you can use them again and again to hammer home the skills and tactics you are working on with your players. Although there’s a wide range of sessions they all come back to one or more of the key principles of attacking rugby. I know that good coaching is about more than just having the right sessions. So each section of Attacking Rugby Made Simple has an introduction from me covering what’s in each chapter, why it’s important, and what you need to look for when you are coaching it. The sessions all include, clear easy to follow illustrations and pointers on when to use them and how to perfect them.